Located in the Central Region of Singapore in the area of Novena. Novena (Chinese: ) is a planning area located within the Central Region of Singapore. Novena area is one of the most expensive housing district in Singapore due to its proximity to the city. Being close to entertainment and shopping district of Orchard and yet still offers the serene tranquility of a quiet residential district. MRT is only 5 minutes away from our house. Please read our guests reviews for more details. We do not charge cleaning fees, but please try to keep the place clean! What we have here is a two-storey house. Almost 99% of the listing here are apartments or condominiums. It is rare to have house so close to the city on -------. The house is not as new as most condominiums on the list but my wife does a good job of up-keeping it. The house was built in 2009. A unique, tranquil and private, 2 storey house. The house is located within a condominium. You get the best of privacy and amenities of a condominium. Our house is about 123 square meters (1323 square feet) consisting of a ground floor living area, kitchen, and a small toilet. While the 3 bedrooms, and two toilets with showers are on the second floor. [BACKGROUND INFO] 123 square meters may not seems like much from where you come from, but in the land scarce city state Singapore, 123 square meters in the central region is quite a lot to offer. Our home is rented out wholly and you will be the only guest. Our typical guests are families or a group of friends traveling together. Our guests feedbacks were the large living space provides them time to interact unlike a hotel. The time they spent together in the living room after a day of sightseeing is the most valuable. Away from main noisy roads, our house provides them the quiet and peaceful environment for a good night rest. It is really quiet. One of our guests reviewed that the only disturbance during their stay was the chirping of birds! The master bedroom has a large balcony. There is direct access to the swimming pool through the back-gate of the balcony. The house is most ideal for family traveling with young children. Serene and cozy - Just like your home away from home. Toddler beds are available upon request. Bedroom #2 has been upgraded to 2x Single beds. We will have new photos soon. Greetings from Singapore! I am a I.T. Manager for a regional company. I have lived and studied in the U.K. and I have also spent a great deal of time stationed in Vietnam during my previous job. I have two beautiful children and we loved travelling as a family too. I am helping my parents managed the property for rent and my lovely wife does the housekeeping. It's a small family run accommodation and we have been hosting hundreds of families from all continents in the past. My parents bought this house as a retirement investment. My sister's family used to live here for a while. It is on the fringe of the city and at the very heart of the Novena Area. The Novena area is an expatriate area with shopping malls and restaurants. It is serene and tranquil. Conveniently located but less the noise and crowd. A large living room gives family the space and time to sit together and talk about their day, something you will not find in a hotel stay. We have been host to numerous families' reunions. Families who lived and worked in different parts of the world but coming here for reunion. It is your home away from home. The swimming pool, although a shared facility with the condominium compound, is seldom used by the residents. Most guests have a fabulous time talking and relaxing in the pool after a long day touring and outing. The pool, according to our guests, is literally behind the second floor balcony less than 10 meters away. Stairs in house. Need to access two flights of stairs to reach main door. It was a great pleasure to stay in this very well designed apartment. There is everything you need to be comfortable. Thank you very much to the owner, for this nice clean and welcoming apartment. I recommend everyone to spend in this place and I hope to return one day. Awesome home, Awesome host, helpful. Our host met us at the property and explained the property and its surrounds in good detail. He left his mobile number with us and invited us to call him at any time if we encountered any problems, which was not necessary. The property is close by to all of the city sites, and the nearby Novena Mall contains a good supermarket (on level 4, bit hard to find initially) and the MRT, as well as some great restaurants for a quick meal. We all agreed it was a great find - smallish living area, but who wants to stay at home in Singapore! Excellent stay at Chi Siangs house. Accommodation worked very well for the five of us and we loved the added touch of the supply of water bottles! 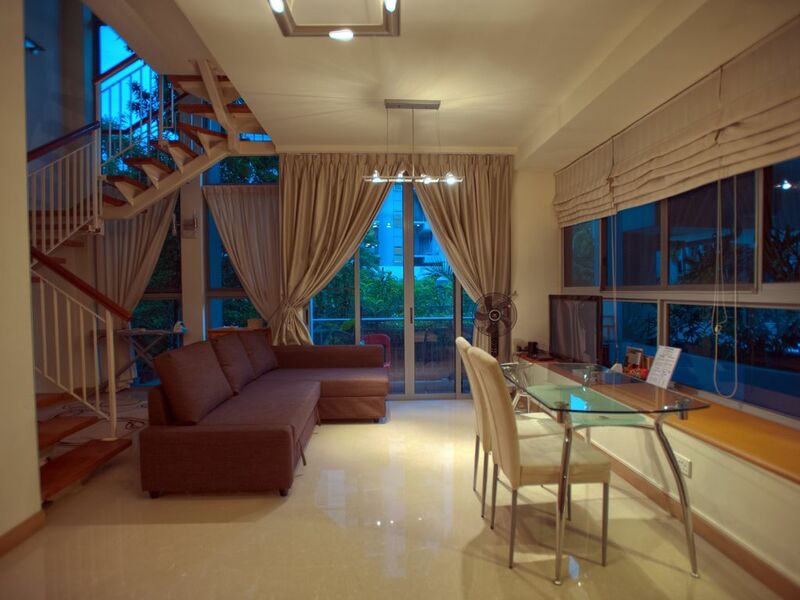 Very good location near Novena station and shopping centre.